Contents: 1. Combustion and Explosion Phenomena. 2. Free-Field Explosions and Their Characteristics. 3. Loading from Blast Waves. 4. Structural Response: Simplified Analysis Techniques. 5. Numerical Methods for Structural Analysis. 6. Fragmentation and Missile Effects. 7. Thermal Radiation Effects. 8. Damage Criteria. 9. Explosion Evaluation Procedures and Design for Blast and Impact Resistance. Appendices. 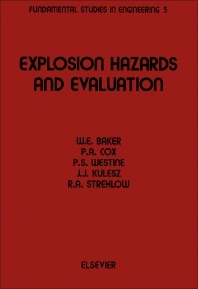 Explosion Hazards and Evaluation presents the principles and applications of explosion hazards evaluation. The text is organized into nine chapters. Chapters 1 and 2 discuss the energy release processes which generate accidental explosions, and the resulting development of pressure and shock waves in a surrounding atmosphere. The manner in which the "free-field" waves are modified in interacting with structures or other objects in their paths is discussed in Chapter 3. Structural response to blast loading and non-penetrating impact is covered in two chapters, with Chapter 4 including simplified analysis methods and Chapter 5 including numerical methods. Chapter 6 includes a rather comprehensive treatment of generation of fragments and missiles in explosions, and the flight and effects of impact of these objects. Chapter 7 considers thermal radiation of large chemical explosions. Explosions may or may not cause damage or casualty, and various damage criteria have been developed for structures, vehicles, and people. These criteria are presented in Chapter 8. General procedures for both the postmortem evaluation of accidental explosions and for design for blast and impact resistance are reviewed in Chapter 9. Engineers, scientists, and plant safety personnel will find the book very useful.